Hatha Yoga teacher training Europe - the Netherlands. The 200-hour yoga teacher training in Europe is given in the Netherlands and has 2 variants. The next start is at the end of August / September 2019. 10 weekends in Wageningen and self-study. Next start: August 31. One intensive 4 week period in Twello. Next start: September 9. This yoga teacher training is acknowledged by Yoga Alliance. When you succesfully complete the training, you can register at Yoga Alliance as yogateacher (200RYT). This way, you can take out insurance as a yoga teacher and work as a yoga and meditation teacher at home and abroad. This yoga course is based on the tradition of non-dual Shaivism. That is the rich tantric tradition that formed the basis of hatha yoga. It uses daily life as an entrance for personal and spiritual development and has a diversity of beautiful meditations. It is a path of awakening that ultimately leads to liberation. Awakening is expanding your consciousness. It is characterized by a love of truth, which continues to deepen. An ever-growing love for the miracle of living and being aware. In the process of awakening, you come deeper and deeper into contact with your essence. Your essence as “true Self” / “your Divine nature”; beyond your identification with your ego. Beyond your self-concepts and conditioning and free from the energies such as judgment, doubt, worry and clinging or aversion. Liberation is the realization of your true Self, which ends all suffering. Like many paths, tantric philosophy also distinguishes the Divine and the phenomenal world. The phenomenal world is everything we perceive; our daily look. In classical philosophy, such as Patanjali, the phenomenal world is seen as not real. That is why in this philosophy one is not so concerned with daily life. The tantric philosophy is very different. It sees the phenomenal world as expressions of the Divine. Therefore, this philosophy invites you to investigate daily life, because everything in the phenomenal world can be your entrance to the Divine. You can therefore use everything in your daily life as an aid in the path of awakening. You can learn to see the Divine in everything. The starting point is therefore always what happens now. Exactly where you are now. Wherever you are. “To become a master of your thoughts” is a commonly heard goal of yoga. This means creating freedom in your mind. The result is that you can choose what thoughts you listen to and how you concentrate. For most people this requires a lot of in-depth practice and meditation. In this yoga teacher training, you will take a major step in this. Therefore, yoga is more than just the poses. Certainly, the poses are important. That is why you will learn the physical, emotional and spiritual effects of the hatha yoga poses in this course. In this yoga teacher training, you do not strive for maximum performance, but for maximum health and body awareness. You adjust the postures to how it is good for your body. Of course you will also learn how to make necessary adjustments for your students as a teacher. However, just doing the poses is not enough to achieve the more ambitious goal of yoga. Therefore, you will learn to work with your breath, focus, energy, mantras and various meditations in this course. In addition, you immerse yourself in various methods of self-examination for more freedom of thought. In this yoga teacher training you will learn a series of hatha yoga poses, various meditations, breathing and relaxation techniques that you can apply in a yoga class. As well as this, you will learn to adjust the postures to the people you teach and you will know the physical, emotional and spiritual aspects of the poses. All teacher skills are explained and practiced. Of course, you will practice presenting, adjusting and improving the poses as well as the structure of a yoga class. In addition to this, you will immerse yourself in, and practice giving explanations of various aspects of yoga such as: anatomy, tantric nondualistic philosophy, the working of thoughts and feelings, meditations, and other important elements that are essential in becoming a good yoga teacher. Read more about for whom this yoga course is suitable and why you would do this yoga teacher training at Spark of Light. 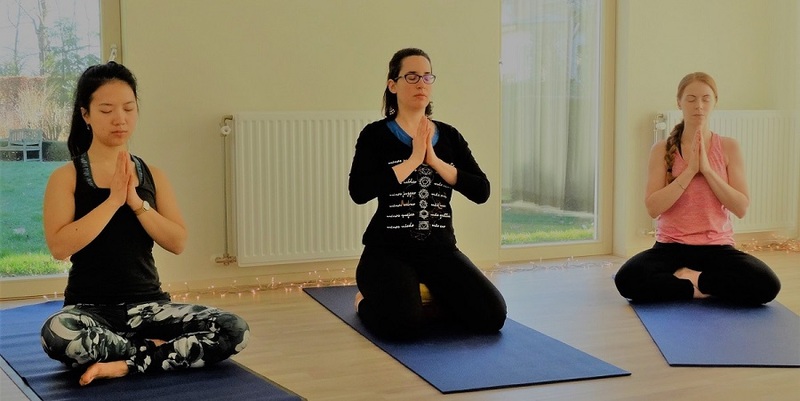 Furthermore, the teacher and all practical aspects such as the modules and day schedule, and when, where and for what price you can follow this yoga course in the 4 week-period or in the 10 weekends.